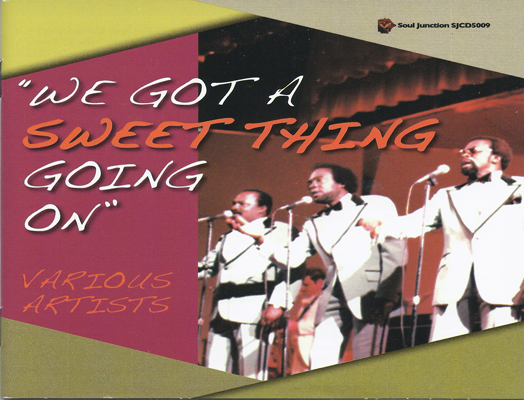 We Got A Sweet Thing Going On is a compilation album dedicated to the art of the harmony soul sound. A genre that was founded in the Doo-wop era of the 1950’s and embraced and continued by the generation that it influenced into the 1970’s. Although often regarded as a genre performed by vocal groups we have used some poetic license by including three solo outings such as Curt Darin’s (a.k.a Curtis Gadson) mellifluous “Two On A Cloud” as well as two recent unissued gems from the late Oliver Cheatham “Good Guys Don’t Make Good Lovers” the flipside of his now deleted 2012 smash “Don’t Pop The Question (If You Can’t Take The Answer)”. Followed by Jesse James with his sublime “I Don’t Want A Divided Love”. The group’s featured in this compilation begin with the highly desirable Hopkins Brothers northern/funk anthem “Shake Cheri“ accompanied by the previously unissued full length version of their Magnetik 45’s flipside “Kiss Of Fire”. Seattle outfit Elbowed-Out are included with their “In The Book Of Guiness” a previously unissued sweet soul ballad that’s a complete contrast to their recently released uptempo, Soul Junction 70’s dance tracks. Moving down the Western Sea Board we also feature Richmond California’s “Natural Impulse” with their now timeless modern soul anthem “She Went Away”. Milwaukee is well represented by former prison group “The Mansion” featuring both sides of their illusive 45 “Stop, Let Your Heart Be Your Guide” and “The Girl Next Door” which they recorded (while still in incarcerated) for the independent Gibbs label. The other Brewtown outfit featured is the Candi-Bars with their crossover classic “I Believe In You” followed by their harmonious “You’re the One” which appeared on their own custom Candi-Stix label. From the same Detroit production team that gave us the previously mentioned Curt Darin release, Probe 1Productions, we have included both sides of their Red Line release on vocal group The Citation “Inspiration Of My Life” and “We’ve Come A Long Way” the latter featuring a live audience. Atlanta, Georgia duo The Trey J’s contribution is both sides of their solitary Tee Fletcher produced 45 release. 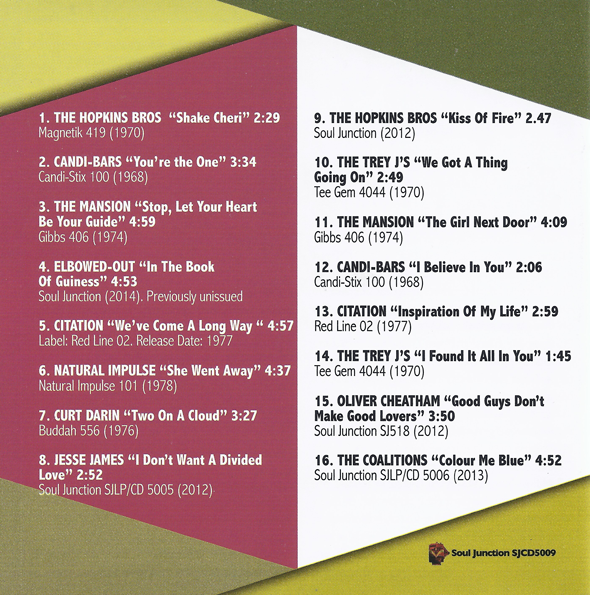 The popular horn driven “I Found It All In You” and the more soulful ballad “We Got A Thing Going On”, the track which inspired the title for this compilation. Last but not least featured is the Philadelphia outfit “The Coalitions” with the title track of their recently discovered “Colour Me Blue” album that had remained in the can since the late 1970s. Front Cover: A rare photograph of The Hopkin Bros live on stage. Additional Artwork by Angelo Acanfora. Mastered by Nick Robbins at Sound Mastering Ltd. Manufactured by GZ Digital Media a.s. (Czech Republic).